He is able to do all sorts of physical contortions and rarely walks anywhere in a traditional manner. Think of how the Droidekas (?sp) (those rolling droids from Star Wars) move. Then you should be able to envisage how Peter rolls down the hall from the lounge to his bedroom - literally head over heels! This photo is of his latest fun. 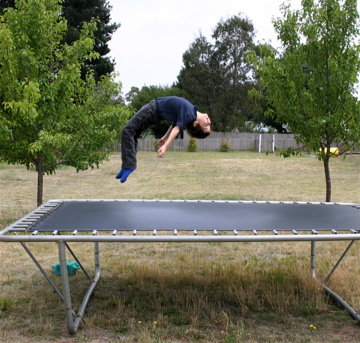 He does a few preliminary bounces and then flips backwards and lands back on his feet! And then easily does it again. I would like to claim he gets this ability from me, but no-one would remotely believe it. We have begun investigating local gymnastics training as I think he really needs it. This week my parents are visiting us and the children are very excited. My parents live in Melbourne, around 800km (500 miles) away and visit us about twice a year. 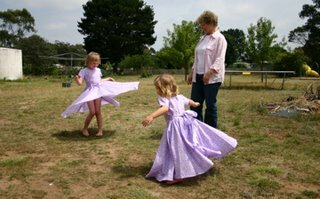 Mum (also known as "Just Grandma") made the little girls some dresses. In this photo you can see them "road testing" the dresses, taking them for a spin. Whenever the girls put on a dress, they have to make sure the dress works properly. Dad and Mum stay at a hotel in a neighbouring town and catch the bus to visit us. Part of the tradition is to visit the local general store and purchase an icecream or some lollies for each of the children. After the children have had books read to them, watched a film together, shown all their latest creations and artwork and walked to the park and General Store, Dad and Mum go back to their hotel for a rest, ready for the next day! We next had to visit the pathology department of the Hospital. It is the regional Public Hospital with what one would assume the typical bureaucracy. We asked at the main reception to whom we should report and were directed to Pathology. We found the Pathology reception and handed over our referral and Medicare number. No forms. One admin staff. Whilst we waited, Lana went into the appropriate room and provided her blood and a sample gathered after the ultrasound. We were done, and whatever cost is covered by medicare. No paperwork at all and no direct cost to us. We navigated through several layers of admin personnel and had the tests administered. The cost was $269 or $215 after insurance ($287 AUD). Later this afternoon, we arrived at the radiology clinic to have our first ultrasound. We answered some questions which were entered directly into their system and were asked to wait. No forms. We went in about 10 minutes after the appointment time. This is just as well as ultrasounds are taken when the mother's bladder is full. Very full. I was to avoid bumps and sharp turns driving to the appointment! All the children were with us, crammed into the corners of the small room. The radiologist occasionally explained what he saw and the children behaved pretty well. After we had all the required measurements, we checked in at the front desk, paid $107 ($80US) of which we will get back around half. Net cost $60 ($45 US). We reported back an hour later to pick up the results. There were bucketloads of forms and several layers of hospital staff to negotiate. We weren't allowed to see the results. They were sent directly to the doctor. We try to arrange an appointment with the doctor at around 20 weeks. This means it is "too late" for most of the tests we don't want anyway. Also, we use a GP (General Practitioner) as they don't do abortions. It takes a highly educated obstetrician to murder children. Lana made the phone call and they recorded the information then. We arrived early for our appointment, but did not have to fill in any forms. They just asked us a couple of extra questions which were recorded directly onto their system. The doctor is part of a medical centre, but officially only uses one admin staff. We then made an appointment for a fortnight (two weeks) later. The cost? Nothing. Bulk Billed. Officially $97.00 ($73 US). Regular visits will be $47, with a refund of $34, Net $13 ($10 US). The US cost? Every visit cost $75 US ($100 AUD) or $25 ($33 AUD) after insurance refund. Forms spanning several pages had to be completed, about a dozen various staff between us and the doctor, every appointment between 30 and 60 minutes late, the doctor spending at most 5 minutes in the room with us. In Australia everyone is covered under Medicare which is paid by a 1.5% tax on incomes. Those on low incomes have this reduced to zero and those on higher incomes will have an additional 1% surcharge if they don't have private hospital cover. Additional funds are provided from the general tax pool. The Australian Medical system is a Private/Public hybrid. Medical services are private, contracted to the public system where required. Any eligible payments are made to the medical provider and a refund for the official amount is received from the Medicare offices. (Like private health insurance). The Medical provider can also opt to "Bulk Bill" which means providing the service at the standard fee with no additional charge. The US system (for the bulk of the citizens) is based on a private health system. The facilities provided - that we experienced - matched what we receive here. In the US, health insurance for a family of 8 was around $1,400 US ($1,867 AUD) per month. I treated Health Insurance as a Tax when I compared Australian and US tax systems. It worked out around even. Today we visited the doctor and also the Ultrasound on our first step in the baby delivery process. I will be making this into a bit of a series, comparing this journey with our American experience. That will be the next post. The baby is a boy and doing very well. All essential equipment is in place, heartbeat strong and obviously he is very happy where he is at the moment. There is only one baby in there (phew!). Some of the children were hoping for twins to keep the boy-girl ratio the same. 1. The name should be short as our last name is long enough. 2. The first letter can't be the same as any other in the family, or our last name. So A, B, C, D, E, J, L, P & R are taken. 3. The letters mustn't end up with a stupid acronym. 4. The name isn't the same as any in our immediate family. If it meets these conditions, and passes the parental veto, it is stuck on the fridge and we try it out. 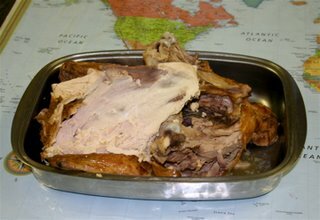 When I was getting the camera to take a photo of our Turkey remains, Rose rushed in saying, "Me. Me." This is her photo. 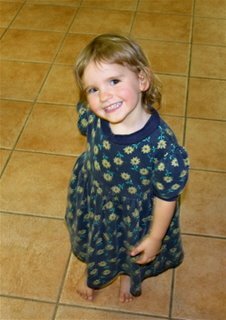 When she wants to get anyone's attention, she calls her version of their name (Babbits = James, Eggic = Eric, Awial = Ariel, Tare = Clare, Mam-ma = Grandma, Owwpa = Opa) followed by "Yoo hoo!". This morning we found her in our bed between us. 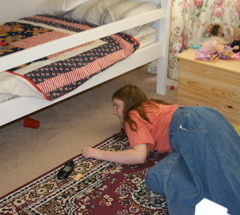 To get out she shimmied down to the base of the bed under the blankets and escaped through a gap she made at the end. So much for a beautifully made bed. When she over-reacts to a denial of one of her requests (see here) Lana often tells her to "Get over it." "No over it" she responds. Or when we laugh at her she stamps her foot and says, "Not funny". (which of course is funnier still). She is also a quick learner. "Did you do this?" Grandma asks. "Clare did it." is the instant response, regardless of the facts. This is just another example of "The Eleventh Reason". Today we celebrated Thanksgiving. Australians don't celebrate Thanksgiving. We never did have to worry about freezing and starving over winter, and there was no religious reason in the starting of the country. We began as a Penal colony. Free Settlers only began arriving after the colony had a chance to survive and convicts who had completed their terms decided to stay (they couldn't get back very easily). We enjoyed the idea of giving thanks for the blessings God has bestowed upon us and have begun our own tradition of celebrating Thanksgiving the Saturday after the third Thursday in November. We experienced Thanksgiving in the US here and here. We would celebrate too - but with an Australian Flavour. Lana's parents and a good family friend joined us for this new custom. Today was 35C (95F) - not your typical Winter's day. Bushfires are raging in various places around the country. But we still had Turkey. A 6.6kg (14.5lb) Turkey cost $46 Aust ($34.5 US) which is a lot more than US prices. To this we added Potato Bake (layered sliced potatoes, with onion and cream with a cheese top, baked in the oven), beetroot, pineapple, tomato, cucumber, rice salad, cabbage salad and Lana's Belgian Mayonnaise. Once the main meal was over (with enough for traditional leftovers as you can see in the photo), dessert was Pavlova, cheesecake, Pumpkin Roll and icecream. We then enjoyed a movie during the hottest part of the afternoon and once it cooled down the children played outside licking icypoles (popsicles). All in all I think this was a successful inaugural Australian Thanksgiving. On this Friday I remembered with fondness the unique American experience of "Black Friday". Black Friday is the day after Thanksgiving where most retail businesses traditionally go into "the black" - that is, make a profit. Traditionally this is the day of lots of amazing deals. If you are not fond of shopping, this is the one day you stay off the roads and at home. As part of our last US Thanksgiving I joined one of my friends to experience this phenomenon at the local Walmart. After several hours of travel, standing in line, and browsing, I came home with a $15.00 Food dehydrator. Although it was a good deal, I was strangely relieved not to have gone through the whole Black Friday experience and return home with nothing! Ariel has been pretty busy working with me in the city and we stay at a hotel near the client's offices. Ariel is doing pretty well on what is effectively her first job in an office environment. Thursday night is late night shopping in Sydney so we went for a stroll and were "seduced" into a number of bookstores. 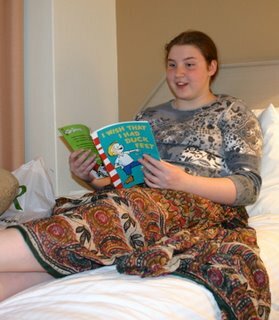 Whilst Ariel purchased a number of books she wanted with her new found income (after her 1/3 savings), I purchased a couple of books for the children at home. Later when we had returned to our room Ariel asked for her books. I gave her "I wish that I had Duck Feet", a classic tale the children enjoyed so much that our existing copy was missing over half the pages. "Thanks, Daddy," Ariel replied, and promptly began reading the book very enthusiastically. Part of our shopping trip most Saturdays involves a visit to the Goulburn Library. The library is attached to an Art Centre which has this fascinating piece of art on the outside wall. It gives a very clever 3D effect to a 2D collection of metal and wire. It is reminiscent of the famous Shearing at Newstead painting by Tom Roberts. 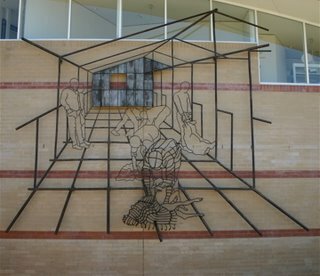 This art is flat on the walll, not more than 15cm/6 inches off from th bricks. 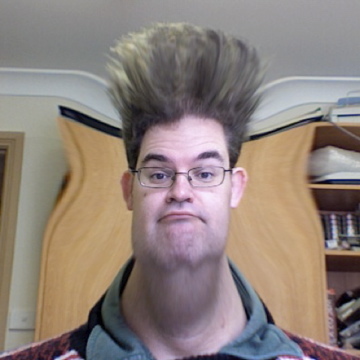 We have just discovered Photobooth software on our Mac. Other than the practical use taking set shots there are a set of filters to "enhance" the photos being taken. The children reckon this would make a good photo for my passport when it next needs to be renewed. Last weekend I was able to use iDVD and iMovie and our new Video Camera. 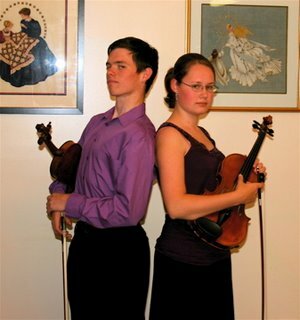 These two young people needed to prepare a DVD of a live recital for their music course. The assignment was worth 50% of the course's results! I always like playing around with new technology and I was surprised how easy it was. We gathered together lots of lights to help with the video-ing (is that a word?) and captured great footage of the three set pieces they had to complete. "That's all fine," I said, "How about doing something you enjoy without the music sheets?" They looked at me and each other. "What about this?" she asked. "I don't know it, but I can follow along." he replied. They did really well and the "DVD Bonus Feature" was really enjoyable. It was amazing how simple it was to use iMovie and iDVD (Apple software that comes standard with all Macs). I tested the DVD on our Macs, Windows PCs and the DVD player. "Great!" we thought and burned two copies and gave it to our young stars. They first tried it on their Dell PCs and they didn't work! But they did work on the DVD player, so it seemed to just be their Dells. Phew! Life in a Shoe is hosting the latest Carnival of Childrens' Comedy, including Ariel's tale of sleep moving. I really enjoyed the post just below the carnival too. Check out the size of this spider! Last weekend the local villages were all pretty busy with over 1200 bicycle riders participating in "The Vaude Highland Fling". 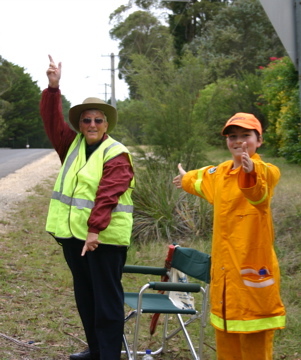 The local volunteer fire brigades were hired to provide marshalling services, assisting riders whenever they came to intersections and needed to be pointed in the right direction. Our first photo is of one of the local fire brigade's finest. He was stationed at an intersection of a dirt track ending the non timed portion of the section going through the village. Once they rode over the timing mats, they could begin racing. In an effort to stimulate their continuing excellence, he pointed the riders in the correct direction and informed them, "Now bugger off! That way! Hurry up!" Ahh, the eloquence of Australians. Meanwhile, Lana's Mum and Eric were staioned at another corner, ready and waiting to point the riders in the right direction. In case you were wondering, this is a staged shot. They really did point the riders correctly when they approached. Note Eric's new outfit. Lana went to work with the sewing machine on Saturday to shorten the sleeves and pants to fit. I'm sure he'll grow into them. While I am working so much in the city I am staying at a hotel many weeknights. 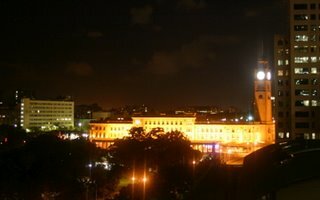 It is quite different from home. It is generally noisier and certainly much lighter. If you leave home after dark at home you mustn't forget the torch (American:flashlight). Lana's Dad once forgot when he went to a firebrigade meeting. It was light when he left, but was dark by the time he returned. He slowly travelled with his arms outstretched before him and stepped very, very carefuly. Mind you, there are some very interesting views. This was what I saw out my Window last week - Central Station Sydney by Night. Ariel often has vivid dreams which occasionally spill over into reality through sleep talking and even sleep walking. Today Ariel related one of her nights a few months ago as she related it to a visitor who would be sleeping in her room. This photo is just to give you an idea of the bed situation in the girls' room. Ariel sleeps in the upper bed and Rose is in the lower one. Ariel dreamed that she needed to get her bed into the spare room. (There is no need to understand why as this is all in a dream remember?) Eric wouldn't respond to her requests for help so, in a huff, she had to get down and do it herself. But the bed was too heavy to move far so she gave up, pushed it back, and went back to bed. Next thing she woke up to a bang and cry as Rose fell out of bed. On the wall side! "Oh no!" Ariel thought, "It wasn't just a dream". She quickly rushed to the ground, picked up Rose, placed her in bed and calmed her down and then moved the bed all the way back to the wall. Her friend who was to sleep in the upper bunk remarked, "Don't have any bed moving dreams while I'm there OK?" Those Coke & Mentos guys have done it again. 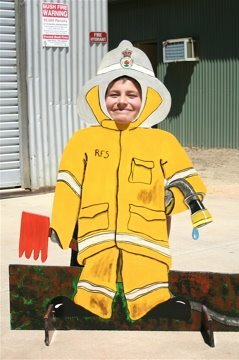 Now that Eric is twelve, he has joined the local volunteer fire brigade as a junior member. Each Wednesday he joins Lana's dad and assists with the weekly training and preparations with the rest of the brigade. He has helped with setting up and organising equipment and got to ride in one of the fire trucks. Last month when we attended the Firewise meetings Eric posed for this photo. Now he has received some second hand yellow overalls and special boots. 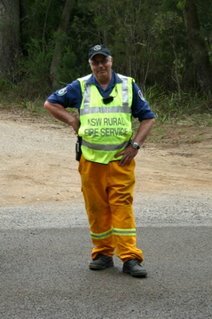 Considering that the fire brigade members have to supply their own gear, receiving a uniform is a very handy start. Being a junior member Eric will not be attending any actual fires. That will have to wait until he is sixteen. Until then he will learn all that needs to be learned and provide important assistance back at base (the fireshed). On a cold and misty midday, we visited the local Cemetery. 1 November is All Saints Day (the orignal reason for Hallowed Eve - Halloween) and 2 November is All Souls Day. On this day we are encouraged to especially remember the faithfully departed that are going through pre-heavenly cleansing - "as by fire" according to St Paul. So we visit a cemetery and pray a family rosary amongst the tombstones, remembering all those that have gone before us, asking God to have mercy on their souls. This does is remind us all on the gift of life. We read tomb stones for people that died from only a day old to one lady who died at 100 years old. They died from as long ago as 1816 and as recent as last week. 1816 is amazing considering colonisation of Australia was only begun later than 1788! 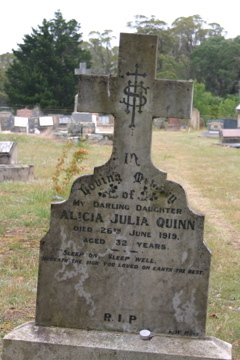 This tombstone near the entrance is from 1919 for a lady that died at 32 years of age. The headstone erected over 85 years ago is now at an angle as time has shifted the supporting ground and the writing is weathered and worn. This is certainly a graphic reminder of the verses from Ecclesiastes - Vanity of vanities, all is vanity. The last week or so we have been blessed with some cooler weather, and - joy o joy - good soaking rain. Our water tanks are filling again after a two month dry spell. Unfortunately, the weather has been so cold that we had severe frosts. 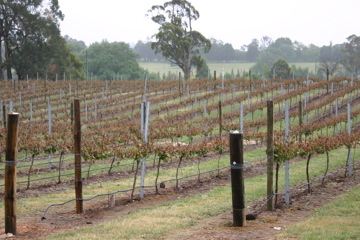 When I drove past this vineyard less than ten days ago, the leaves were a bright green. I remember thinking how lovely it looked and it reminded me of Spring in Georgia. This photo is from yesterday. The frost has destroyed almost the whole crop. A related article is here. The industry was worried about an over-supply and reduced prices about two weeks ago. Now they have the opposite concerns. Farming is such a difficult business. Queen Victoria is famous for the statement, "We are not amused." Currently I pass a statue of her located in the front of the Queen Victoria Building in the center of Sydney most weekdays. Today I finally captured the reason she isn't amused now. Here you can see a pigeon using her head as a temporary roost. 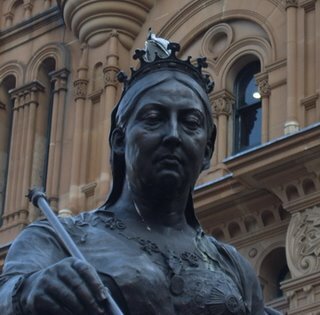 The Pigeon's calling card is on Queen Victoria's neck and she certainly does not look amused! This is a party favourite and is a speciality of Ariel's friend (known as TTTT). TTTT claims that you cannot be a member of her cooking club until you have burnt the base or caramel filling. Ariel will have to wait until next time to see if she qualifies, as this one went just right. Place all ingredients in bowl and mix. Press into a lamington tray and bake for 10 minutes at 375 F (190 C). Place in saucepan and cook until it bubbles then spread on slice. Cook for further 10-15 minutes or until golden brown. 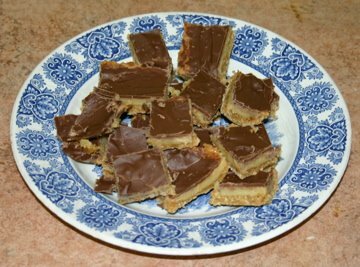 Melt 250 grams/8 oz of chocolate then spread on caramel slice. Then put in fridge until solid. This is a double recipe and makes plenty to share. All the broken and remainders after sharing go to Dad.